(in addition to the general properties of zeolite): Green and pink are the colours of heulandite most commonly used in crystal therapy. I will use green here as an example. Green heulandite has a gentle, soothing, watery energy, which connects with all chakras, but mainly the Heart, Upper Heart and Solar Plexus. It allows one to feel safe and cocooned, while it reorganises and stimulates the energy body. It supports the immune system, and can be used to treat sinus problems and IBS. It also gently opens the Third Eye, and facilitates psychic development. Heulandite assists us in letting go of the constraints we place upon ourselves, allowing us to remain more open and centred. Green heulandite can also be used to connect with nature energy and the Fairy realm. Melody suggests its use to connect with ancient information from Atlantis and Lemuria, and as a synthesis crystal, which helps us to combine old and new. Healing qualities of zeolites are similar between members of the group. Most contain sodium and/or calcium, making them highly cleansing, in addition to the group’s refining and purification qualities. Many are piezo- and pyroelectric, so encourage transmission of energy. Heulandite is actually a series of zeolite minerals, which, like stilbite, is calcium sodium aluminosilicate hydrate. The elongated tabular crystals are widest at the centre, giving them a characteristic coffin shape. It is most commonly colourless or white, but also forms in a range of other colours. Green heulandite crystals have a pronounced curve. Heulandite forms at low temperatures, and is found in a wide range of geological environments, including in cavities of granite, pegmatite and basalt, along with other zeolites, and weathering andesites and dolerites. 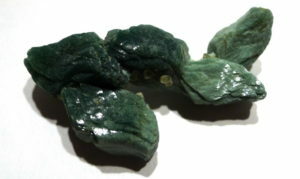 Heulandite is used in petrol refining. Zeolites are a group of more than fifty water-containing silicates with an open structure which allows easy movement of ions between the cavities, meaning zeolites can trap or exchange the ions moving through them. Some zeolites have the ability to exchange sodium ions for calcium ions present in hard water, and are extensively used in water softeners. Others can act as molecular sieves, and are used in petrol and gas refining. Silica gel, used as a desiccant and dehumidifier, is a product of analcime, one of the zeolites. Common zeolite minerals include natrolite, heulandite, scolecite, stilbite, and scapolite. Named in 1822 by Henry James Brooke in honour of Johann Heinrich “John Henry” Heuland (1778-1856), a British mineral collector and dealer. There are no traditions associated with this mineral.